In Singapore, we experience sunny weather all year round, allowing us to enjoy outdoor activities and fill our wardrobes with sleeveless tops. However, it’s not so great when a quick stroll to the convenient store nearby gives you sweaty pits. Stuffy public transport may make it worse, especially when you have to raise your arm to hold the handrails. You catch the whiffs of odour emitting from your underarms, and pray that those near you won’t catch on. Hang on a second. Why are we embarrassed for something as natural as sweating?! We are given the ability to sweat for good reasons, and being self-conscious isn’t one of them! Perspiration should be embraced as it has many health benefits! There must be a reason why many people believe sauna and other sweat-inducing activities are great for our bodies. Apparently, sweating may help your body detoxify as alcohol, cholesterol and salt are expelled from your body when you sweat. This helps to reduce the existence of system-clogging substances in your body. If you find yourself in happier moods after an intensive work out that left you soaking in sweat, you’re not imagining it. Exercising releases endorphin into your system, which helps to fight depression and stress! However, everyone requires different levels of endorphin, so it’s necessary to figure out how much sweat you have to work up before you experience the positive effects. The endorphins mentioned above don’t only make us feel better, they also act like natural pain relievers. This means that working up a sweat may help to relieve the soreness in your body! While you may detest the stickiness on your skin when you sweat, perspiration actually helps to open up your pores to release all the existing gunk built-up! This prevents their evolution into annoying zits. One thing to note though, always cleanse your skin thoroughly after sweating so that you don’t reintroduce the gross stuff back into the pores. Now that we are aware of some of the benefits perspiration can provide, the main question is – do we still need to use antiperspirants? It doesn’t make much sense to introduce foreign properties to our bodies when they help to prevent beneficial perspiration from occurring. Furthermore, antiperspirants contain aluminum-based compounds which act as a temporary blockage to sweat ducts, preventing perspiration. Although debatable, some studies found that the chemicals used in antiperspirants (such as aluminum) will be absorbed by the skin, and may alter our DNA, affecting females’ estrogenic levels. This may result in the growth of breast cancer cells. While more research needs to be done to confirm this, it still pays to be safe than sorry. You may ask then, that if you can’t use antiperspirants, what should you use? As mentioned above, sweating isn’t the issue because it is actually beneficial for our health. However, what really bugs us is the stench of our sweat. In actual fact, our sweat is originally odourless. But when it comes in contact with the bacterias in our sweat glands, a stinky odour is produced. This shows that we don’t need antiperspirants, and should make the switch to deodorants instead! Deodorants are different from antiperspirants because they do not suppress your flow of sweat. Instead, it neutralizes or masks body odour caused by bacteria without interfering with perspiration, which is a natural cooling process. Up your game by going for a natural deodorant, which not only reduces the risk of any skin issues and diseases, but also prevents pores blockages and unsightly staining of white shirts. Meow Meow Tweet is a good place to begin your natural deodorant journey! The brand prides itself on producing products that are vegan, all natural, organic, cruelty-free, environmentally friendly and made of Fair Trade ingredients! This socially and environmentally responsible company produces small-batches of skin care products that are handcrafted, and is dedicated to improving their products to meet suit customers’ needs. 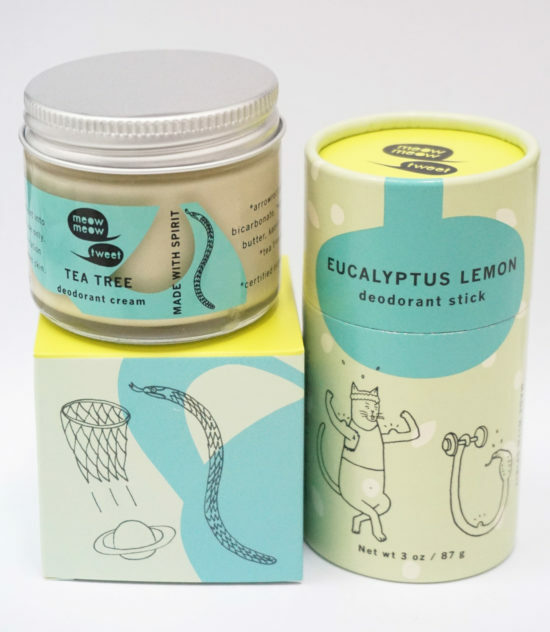 At HealthLoco, we were intrigued with Meow Meow Tweet’s natural deodorants and reached out to the brilliant people at Living Naturally Co., the exclusive distributor of Meow Meow Tweet products in Singapore, who kindly sent us some of the awesome products to try out! 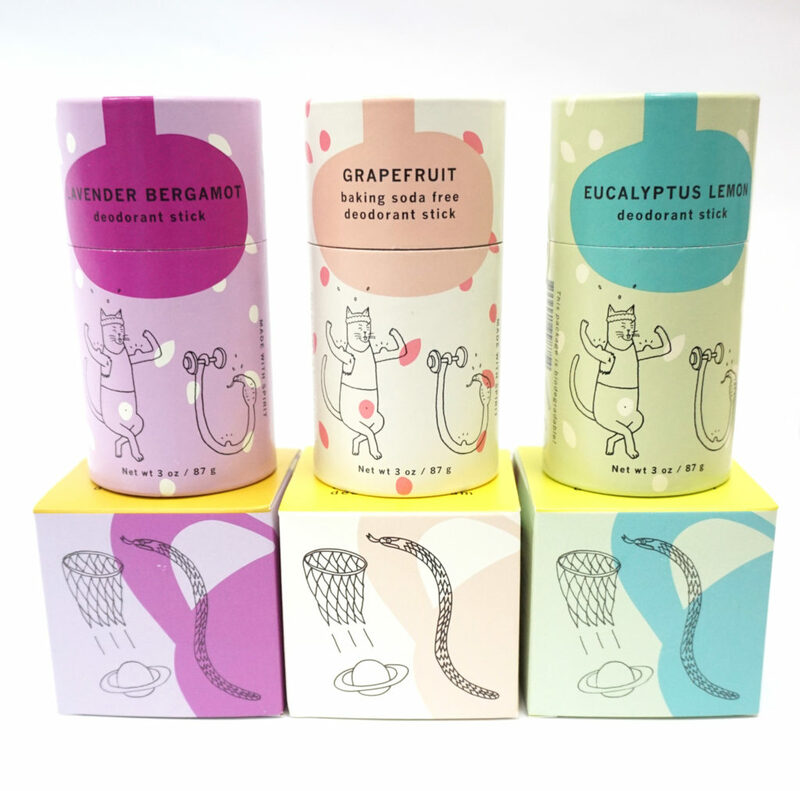 We can’t get enough of the cute packaging with cat designs drawn by the company’s co-founder! In order to avoid the use of plastic, the deodorants come in two types of packaging – glass jars or biodegradable paper tubes. Made of skin conditioning, organic plant oils and butters, Meow Meow Tweet claims that the deodorants moisturize and soothe our pits and are gentle enough even for sensitive skin! We tried 7 deodorants and this is what we think about them. These are more portable options to throw in your bag when you want to bring your deodorant around. We liked that we didn’t have to dip our fingers into the deodorant, and enjoyed the convenience of direct application. However, as mentioned by Living Naturally Co., the sticks were slightly challenging to push up. In addition, they are not retractable. Nonetheless, we thought this was a worthy trade-off considering that the packaging is made of biodegradable materials which can be composted in a year! The scent of the deodorant sticks lasted around 2 to 3 hours on us (this varies depending on individual’s body chemistry with the deodorants), before fading off gradually. The deodorant sticks felt very comfortable on our skin despite being slightly greasier than the deodorant creams. One of the favourites among the ladies in our team, we found this scent pleasantly familiar on the first sniff. We were trying to describe the scent when one of our team members shouted, “Chupa Chups lollipops!” That’s exactly what this smells like, a sweet lollipop that isn’t too overwhelming, but still has a mood-lifting effect! This is a perfect option for those who are sensitive to baking soda, and also turned out to be the most popular scent among our team! The citrusy scent of grapefruit smells really refreshing and feminine, making us feel like we just stepped out of the shower. If you’re a fan of lavender scents, you will definitely love this. A few of us found the scent to resemble that of a calming spa, while the rest thought it was a little too strong for their liking. We know fragrances can be a really subjective preference, but if you are looking for a slightly stronger lavender scented deodorant, we highly recommend this to you! One of the brand’s most famous products, these deodorant creams are popular and well-known for their effectiveness! Housed in a glass jar, we had to dip our fingers into the jar to retrieve the product, which we found to be quite inconvenient. Also, the jars were not very portable due to its glass material and weight. Similar to the deodorant sticks, the scent of the deodorant creams lasted only about 2-3 hours and will require reapplication. While the deodorant creams weren’t as greasy as the deodorant sticks, we found it a little harder to spread across our pits and felt a little waxy on our skin. This scent did not fare too well with our team, because we found it to be a little overwhelming. In addition, it reminded us of the acne treatments we used due to the strong tea tree scent. If you’re someone who’s interested in a more medicinal scent, this one will be right up your alley! 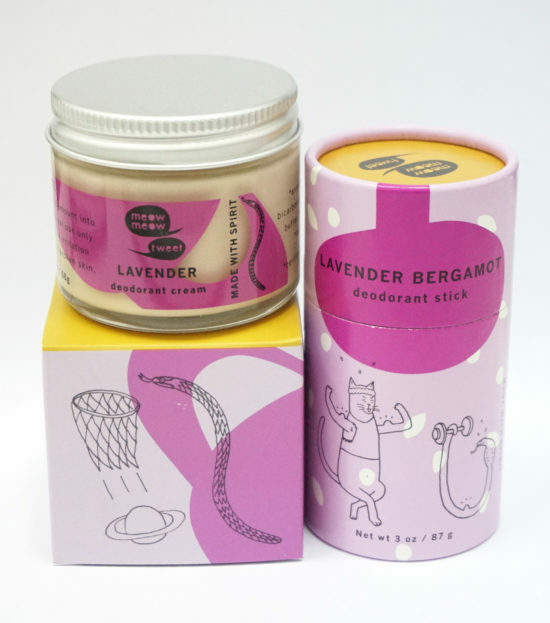 Compared to the Lavender Bergamot Deodorant Stick, we would confess that we prefer this one more. This smells slightly more soothing and the scent is not as strong. The addition of bergamot probably amped up the scent of the deodorant stick. Similar to the one mentioned above, this is great for those with sensitive skin who’re looking for a lavender scented deodorant without the addition of baking soda. For some reason, we found this to be smell slightly milder than the Grapefruit Baking Soda Free Deodorant Stick. Nonetheless, it was chosen by our team to be the best scent among the deodorant creams. This is great for those who are unsure which deodorants to get as you’ll never go wrong with this fruity scent! 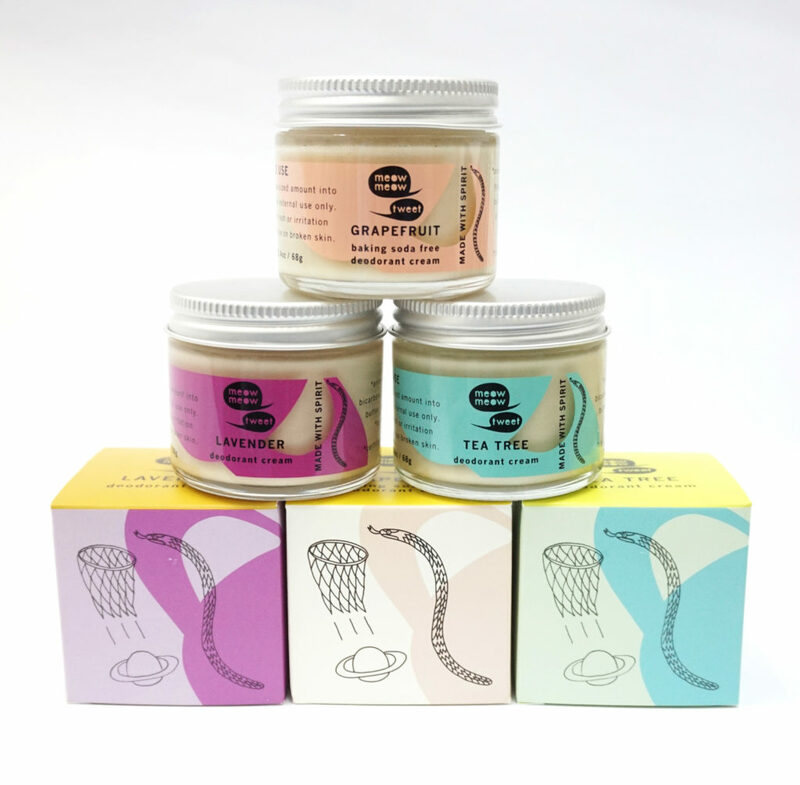 To get your hands on these Meow Meow Tweet’s products, you can head on over to Living Naturally Co.’s website. They ship domestically (Singapore) and also internationally! Living Naturally Co. carries many types of deodorants, from brands such as Meow Meow Tweet, Piperwai, Soapwalla and Schmidt’s Naturals. So if you’re looking for a new deodorant to try out, this is the perfect place to start. In addition, customers can find luxurious skincare brands such as Soapwalla, JUARA and MUN here too! 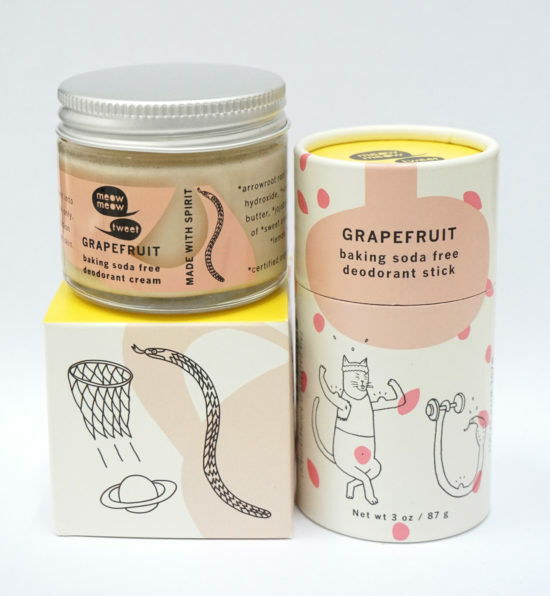 Living Naturally Co. is currently running a 35% discount on their current batch of Meow Meow Tweet products, so now is a great time to make the switch to natural deodorants! Connect with Living Naturally Co. through their Facebook Page or Instagram! Start the new year smelling fresh and good with some Meow Meow Tweet deodorants! In collaboration with Living Naturally Co., we’re giving away 3 sets of Meow Meow Tweet deodorants (worth S$53.80 each) to lucky HealthLoco fans! Be the first to get win newly repackaged products from Meow Meow Tweet which will only be available on Living Naturally Co. in January 2018! 3. Tag 2 friends and comment in this Facebook post the deodorant set you would like to win! That’s it! Giveaway will end on 1 January 2018. *Contest is open to HealthLoco fans from Singapore only.